In life, there are facts and there is fiction. Fiction, or the story we tell, can either set us free … or chain us. Behind every disturbing emotion is a disturbing thought. When examined, many of these thoughts contain logical flaws or distortions, such as being too hard on ourselves, exaggerating the importance of a negative event, or focusing only on the negative. To control negative emotions, we need to take control of the thoughts behind them. Except in situations when we’re demonstrating remorse over actions that harmed someone else, guilt is essentially a worthless emotion. Most guilt is self-directed, after perceiving that we’ve failed to live up to the expectations of some external source. If we take a really good look at why we feel guilty for any particular situation, we will probably find that the thought process is not our own. It was something passed down to us from someone else. Guilt has kept so many stuck in the same place for years. Our parents, grandparents, teachers and role models may have told us stories meant to help us, but containing limiting beliefs that blocked us from actually achieving our full potential in life. This useless emotion became a vicious cycle that many are still trying to step out of, or don’t even realize we are in. But doesn’t it make sense to worry? Don’t bad things in life happen often enough to give pause to even the most resolute among us? Doesn’t worry prepare us to deal more effectively with life’s eventual losses and tragedies? In Brené Brown’s research on shame, courage, vulnerability and other human emotions, she has found that people often dress rehearse tragedy in an effort to beat vulnerability to the punch through worry, numbing and a number of other self-sabotaging behaviors. The kicker is that insulating yourself in this way ends up robbing you of love, belonging, empathy and joy. Personally, I’ve learned that it doesn’t serve me to tell a painful story about the past, present or future. Through some introspection and work, we can use even failure and misfortune to create feelings of excitement about what we can create, even in trying circumstances. We can never be fully “in charge” of what happens in this world. But the good news is that you are in charge of your story. 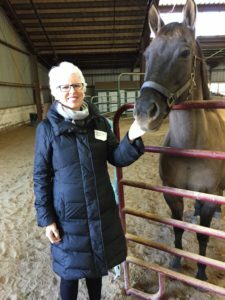 That time I tapped into my “Horse Sense.” Click here to read about it! Need help pushing past useless emotions? As a life coach, I believe we can change our lives one day at a time. We’re not broken, and we don’t need fixing. We have everything within ourselves to create the life we’ve always dreamed of. Life coaching is all about changing the way you look at everyday circumstances, and helping you blast past roadblocks (like guilt and worry) so you can live your best life, now. We’ll take a look at where you are now, where you want to be – and chart a course to get from here to there. Even if you’re already successful, hiring a life coach can help you up-level your life. In fact, some of the clients who get the most out of coaching are the ones who have achieved amazing things in some areas of their lives … but know they could be better in others. (Read testimonials from some of my happy clients here.) Let’s work together to make sure you are living your best possible life – and showing up as the best version of you.